For centuries Pu-erh tea was given as a tribute to the Emperor and high ranking officials in Imperial China. Throughout Chinese history, accounts of it’s many health and medical uses range from prevention and treatment of: heart disease, cancer, diabetes, inflammation, as well as aiding in digestion. Pu-erh tea like all teas is made from the leaves of the Camellia Sinensis plant. The tea has a very distinct flavor which have been described as earthy, chocolate-y, and also “dirt.” The unique flavor comes from the way in which the tea is handled, and later aged. Pu-erh can take one of two paths after the leaves have been picked, they can undergo a ripening process or it can be immediately compressed. When ripened before compression, the tea is considered to be “cooked,” alternately, tea that does not go through the process is called “raw” pu-erh. The compacted tea takes shape as a cake, a brick, a mushroom, a nest, or a melon shape. The tea is then traditionally dried, with each shape taking on different characteristics as it dries. Finally the tea is then aged as little as a few months, but some have been aged as much as 80 years. The finished product is then flaked apart and brewed as the tea is needed. The traditional use for Pu-erh tea was medicine. It was used as a cure for “internal dampness” or the build up of negative energy from the spleen’s inability to utilize chi (energy) from the stomach. It was also used in China for the removal of toxins from the blood, and reduce toxins in alcohol. Weight Loss– Rich in antioxidants and other minerals, Pu-erh is found to help suppress fatty acids. This is all due to the unique “fermentation” process to create enzymes that produce micro-nutrients essential to help create a more functional metabolism. Lowers Bad Cholesterol and Raises Good Cholesterol – Pu-erh helps in lowering of bad cholesterol and the increasing in good cholesterol. This is good as it can reduce your chance of cardiovascular disease. Fight against Gold Staph – Staphylococcus aureus or gold staph is a bacteria that usually causes rapid food poisoning symptoms, including nausea, and vomitting. I personally am very fond of Pu-erh and claim it to be my favorite type of tea. My favoritism towards this tea I guess is two fold: I have come to like the earthy taste of most Pu-erhs, and I feel like I am sipping on ancient wisdom because I have read all about the medical history involved in it’s past. It takes a lot to get used to drinking it, but once you have learned to enjoy the taste, it becomes something you may become very fond of. This entry was posted on September 8, 2010 by Jordan M. Williams. It was filed under Health Benefits . Glad the post inspired you to have a cup. I hope you enjoyed it. Oh Linda I would love to talk to you about you work with Lipton. I will have to email you sometime soon, or if possible could I skype interview you? I agree with you that puer tea takes a while to get used to. Once you do get used to it though, it becomes a staple. Do you like shou or sheng puer better? I prefer shou, but have recently found myself easing into a good sheng i just bought while in China. Are you familiar with sheng pu-erh? I would love to hear more about it. 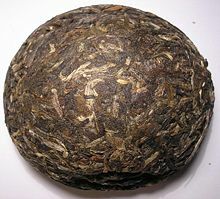 I’m not a fan of Pu-erh but I’m still fascinated by its looks, history and story each of these aged teas seems to tell. Nice photo and informative post. Not a fan of Pu-erh huh, it look me a while to get into it. My best friend detests it, he say’s it tastes like dirt… and more dirt. Pu’erh is a decent tea. I appreciate it for what it is. I usually get two different tastes from pu’erhs, either 1) earthy, smoked wood, or 2) vegetal. The only tea I am not keen on is black tea. I mean, I’ll drink it if it is offered (and as loose leaf, not those bags that pass as tea that my roommates love so much), but usually I will go for something else. Same here Fox, Im not really a big fan of black teas.